The Dorien is a modern Ranch design with eye-catching gables accented with board-and-batten and decorative wooden brackets. The floor plan is completely open with an island kitchen, great room with fireplace, and a spacious dining room. Porches to the front and rear and a screened porch with skylights welcome outdoor enjoyment. A split bedroom layout offers privacy to the expansive master suite while the secondary bedrooms enjoy walk-in closets and a double sink vanity in the shared bathroom. 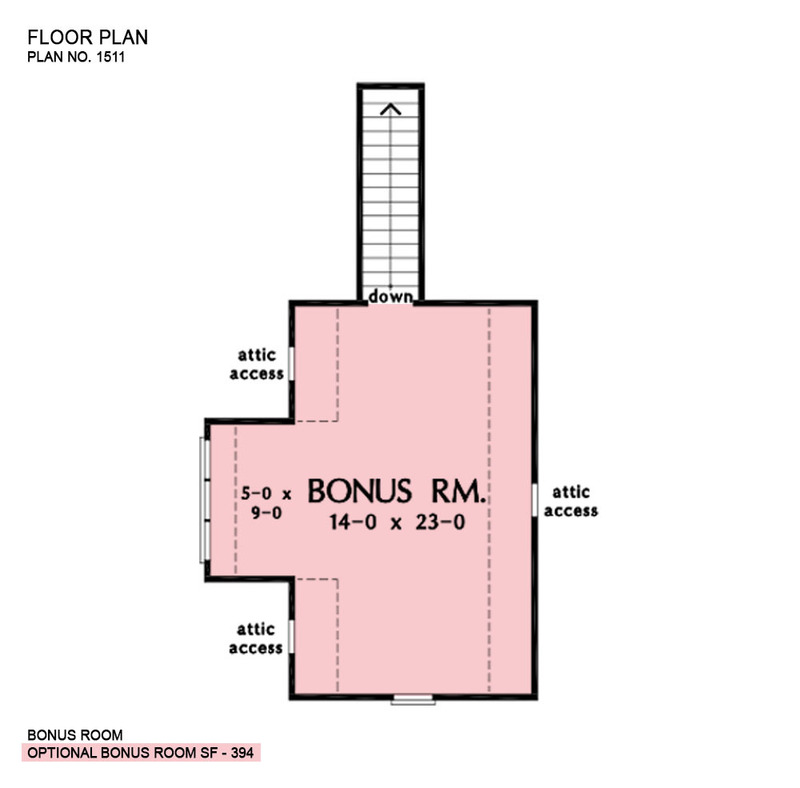 Bonus Room: 394 Sq. Ft.
Porch - Front: 198 Sq. Ft.
Porch - Rear: 118 Sq. Ft.
Porch - Screened: 200 Sq. Ft.
House Dimensions: 65' 8" x 65' 0"
Great Room: 13' 0" x 17' 8"
Master Bedroom: 13' 0" x 15' 0"
Foyer (Flat): 6' 8" x 6' 4" x 9' 0"
Dining Room (Tray): 11' 8" x 12' 8" x 10' 0"
Great Room (Vaulted): 13' 0" x 17' 8" x 14' 8"
Kitchen (Flat): 14' 0" x 12' 0" x 9' 0"
Utility Room (Flat): 8' 8" x 9' 6" x 9' 0"
Bonus Room (Clipped): 14' 0" x 23' 0" x 8' 0"
Garage (Flat): 24' 0" x 23' 0" x 0' 0"
Garage Storage (Flat): 6' 4" x 3' 8" x 0' 0"
Master Bedroom (Tray): 13' 0" x 15' 0" x 10' 6"
Bedroom #2 (Flat): 11' 4" x 12' 0" x 9' 0"
Bedroom #3 (Flat): 11' 4" x 12' 0" x 9' 0"
Porch - Front (Flat): 25' 8" x 8' 0" x 9' 0"
Porch - Rear (Flat): 14' 10" x 8' 0" x 9' 0"
Deck / Patio (None): 14' 8" x 18' 8" x 0' 0"
Porch - Screen (Cathedral): 14' 8" x 12' 0" x 17' 8"